Main Hall. Bell in Main Hall's cupola. Dr. Edward Cooke becomes Lawrence's first president, and the first college-level classes begin. Lawrence University has more students than Madison, Beloit, or Ripon. Its best-known landmark, Main Hall,opens. Used as a meeting place by Appleton citizens during the Civil War, Main Hall also is, according to legend, a stop on the Underground Railway, a network which assists runaway slaves as they escape to Canada before the war. The original bell hanging in the building's cupola once summoned Lawrentians to 6 a.m. prayers and classes. Later it was rung to celebrate football victories over Lawrence's rival, Ripon College, and Lawrence's merger with Milwaukee-Downer College. And rumor has it that once "an unsuspecting little calf" was taken to the cupola. "As night wore on, passersby were puzzled about the source of plaintive bovine wailings that rent the air. Dormitories celebrated the removal of the hapless heifer by serving veal for a week." Four years after William Harkness Sampson selects Goethe's last words- "Light! More Light!" -as Lawrence's motto, the skies of Appleton are bright with light from a fire which burns the college's first building, the Institute, to the ground. 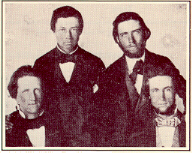 The men in Lawrence's class of 1857. (Colman), also are in the graduating class. 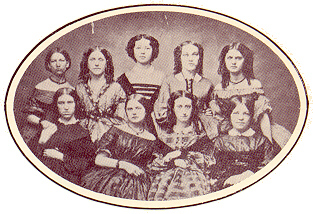 Group of Lawrence women students, 1858-59. After taking two trains from Milwaukee to Oshkosh and a steamer ship from Oshkosh to Appleton, freshman Albert Worden writes home to his family, describing Appleton as "no more like a city than a place of 40 or 50 scattered houses.... It contains no building worthy of note, except the University, which is a large, handsome structure in the center...of the city, one side which slopes gently down to the river on the south, and on the east, west, and north extends a beautiful lawn. This park is well filled with large shade trees and is a most pleasant place....[Appleton] does very little business; in fact, I think it is as quiet here at any time as on a sultry day in your little sitting room where you sit quietly sewing and conversing, Mother, with Father and Sister." Lawrence's second president, Russell Z. Mason, publishes a list of "Things Prohibited" that includes: "Unpermitted association of Gentlemen and Ladies; Games of chance; the use of intoxicating drinks; Profane or obscene language; smoking or chewing tobacco on College premises; Visiting on the Sabbath or in study rooms; Frequenting bar rooms or groceries."